How do you plan for maternity leave when you’re a freelancer? It’s widely acknowledged that going freelance enables you to spend more time with your family, but what about maternity leave how does that work? No safety net of paid maternity leave for us, so how do you manage? Fellow PR and proud mum of two, Lianne Robinson explains how she does it. 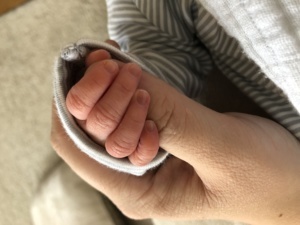 Before you swipe left, please be assured that this is not another blog about your right to claim statutory maternity pay when you have a baby like all the other ‘how to take maternity leave when you’re self-employed’ blogs! This, I hope, is helping to address the real fears of taking some time out when you’re a freelancer – will my clients find someone else? Will I have to start again? When you start to tell people your baby news, their immediate reaction is to talk about how lucky you are to be getting maternity leave – people ask will you take a year off, or just nine months? But when you work for yourself the reality is that neither of those options are probably going to be possible. When you decide to become a freelancer it takes a lot of hard work and determination to build up a client portfolio and secure a regular stream of work. It certainly doesn’t happen overnight. So when you find out your family is growing it’s impossible to comprehend the thought that you might just walk away from all of that. Beyond that there are the financial difficulties. Going a year or even just a few months with no income is a very scary concept, especially when you are self-employed. For me, the thought of not having any money coming in would actually cause me more anxiety than working. I’m realistic enough to know that when the baby comes along I will want to have some quality family time without the distraction of work. So I do plan to take it much easier, but not for long. One of my more time-consuming projects comes to an end just before my due date and I made the decision early on not to look for more work to fill that void until a few months down the line once I have established more of a routine. As for my more regular retained gigs, I’m very lucky to work with some lovely clients who totally understand the situation and could not be more accommodating. One of the many reasons why I wanted to go freelance in the first place was to work for nice people and times like this are testament to that. If all goes well I will be back on line after two weeks – and no, I probably won’t be back up to full speed immediately and it’s likely I may be sending emails in the middle of the night but my clients respect that. They encourage me to take as much time as I need and they’ll be there waiting when I get back. My worries about them finding someone else to look after their PR were soon dissolved when I realise that the relationship and rapport we have built up over the years means that they respect me as a person, as well as a professional and that’s why we work well together. I’m also very lucky to be part of the Comms Crowd, a collective of like-minded freelance individuals. We work on clients as part of a team so when I disappear on my ‘mat-leave’, I know that our clients will still continue to get great results and opportunities as I leave them in the very safe and capable hands of my colleagues. That support is invaluable and it’s incredibly reassuring to know that I can take time off and focus on my family safe in the knowledge that the team are there to pick things up. As such we’ve also been able to do a gradual handover over the last few months which has also really taken the pressure off. When I tell other friends and other expectant mothers that I plan to be back online after just a couple weeks they look at me with that discerning look and I know they are judging me. But that’s okay. You see one of the main reasons that I wanted to work for myself was to make sure that I can take my kids to school, be there for nativity plays and sports days and be able to look after them when they’re sick. So the very small sacrifices I might have to make now, will pay dividends in the long run. When those disapproving friends are heading back into the City with an hour long commute each way after just 12 months, hands tied by a corporate environment that frowns on people leaving on time or taking time off for dependents, I will be at home still managing to build up my business and spend time with the family. I’m in the driving seat and there is nothing better!